It’s already day number three of Armchair BEA. Time flies when you’re having fun! Today’s Instagram Challenge is “Your TBR Pile.” My TBR pile is extremely large, so I just picked a few selections and put them on a table. With a candle. Okay, I made a TBR shrine. The next order of business is giveaways. I currently have two giveaways open, both of which are being sponsored by the publishers. Both giveaways already have their own posts, so follow the links! *edit* – Both giveaways are U.S. only. The first giveaway is “Glow” by Jessica Maria Tuccelli. The book is about six generations of a family living in the American South, each of whose lives are impacted by racism. There is also a ghost. The winner will be pulled from a hat on May 31. The second giveaway is “Shadow of Night” by Deborah Harkness, the sequel to “A Discovery of Witches.” It’s about a witch and a vampire who fall in love after discovering a mysterious old manuscript, and involves time travel. The winner will be pulled from a hat on June 8. And now, onward to today’s genre discussion… literary fiction! I’m very picky about general fiction. I don’t tend to read books that are set in today’s society, because I already live here and don’t need to spend more time in the present. I try to avoid stories that are horribly depressing, because there are enough depressing things in real life. At the same time, I don’t want my books to be completely escapist. I want them to challenge the way that I think about the world and to immerse me in different cultures and time periods. 1. “Glow” by Jessica Maria Tuccelli – See above. 2. “The House of the Spirits” by Isabel Allende – Allende tells the story of a revolution in a South American country and how it impacts a family. Her characters are vibrant, and her world contains just a hint of magic. 3. “The Mirrored World” by Debra Dean – The story of the Russian saint Xenia, as told from the perspective of her cousin. The novel explores the line between holiness and madness. 4. “The Secret Life of Bees” by Sue Monk Kidd – Set around the time of the Civil Rights Act, a young girl runs away from her abusive father and learns a valuable lesson about race and family. Some of the characters in this novel remind me of my aunts, who are wonderful and crazy all at the same time. 5. “Bless Me, Ultima” by Rudolfo Anaya – A coming of age story involving generational conflict and magic, and featuring a blend of Catholic and folk beliefs. What are your favorite literary fiction novels? I am going to “The House of the Spirits” by Isabel Allende to my TBR list. “Definitely Houses of Spirits” since I just finished Discovery of Witches!! I haven’t read anything you mentioned but they all sound really interesting! More for my TBR list! The Mirrored World sounds really good! LOVED The Secret Life of Bees. I keep meaning to read The Secret Lives of Bees – it sounds amazing. And your TBR pile/shrine is fabulous! I loved The Secret Life of Bees. Thanks for the chance for the giveaway, they are new books to me. I’m your friendly ABEA cheerleader for tonight! I like literary fiction and see which books won my Thanks for Changing My Life Awards on my ABEA post today. Hope you are enjoying yourself and look forward to chatting with you again soon. Keep up the good work! YES. The House of the Spirits is an amazing book! I included it on my list for today, too. I think it’s really one of my top books of all time. 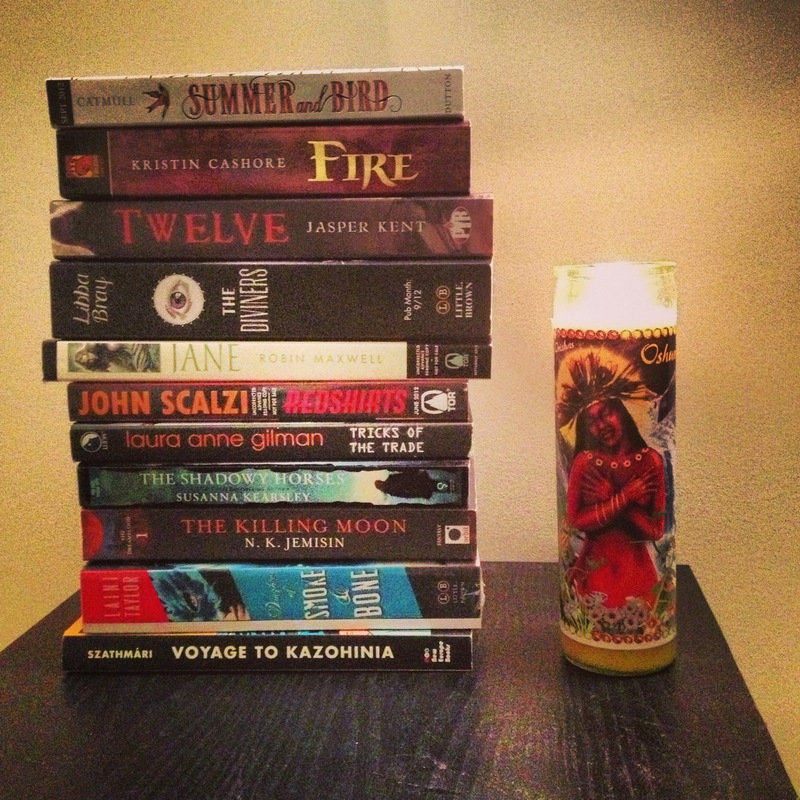 Love the tbr shrine pic! If I put all the books on my tbr in a pile, it would be impossibly tall. I absolutely love Allende’s House of the Spirits. I actually wrote about it yesterday! I heartily recommend Fire and Twelve from your TBR. I enjoyed both – and Twelve is historical/russian/supernatural – win/win/win! I’ve read The House of Spirits and The Secret Life of Bees and enjoyed both – did you read The Help?? I haven’t read “The Help,” but I do have it on my Kindle, so I’m hoping to read it eventually. I liked The Mirrored World as well, something out of my usual genre of reading. The House of the Spirits is also one of my favorites. I think I could have made a list of about 200 books, but felt overwhelmed! I also loved The House of the Spirits. Oh, I heard of Secret Life of Bees. Your TBR shrine is awesome! I’m more of a person who wants to read more historical fiction books, while still reading contemporary. My literary fiction choices tend to lean toward the weird/postmodern. I made some recommendations on my blog today, but one I left off was a favorite by Siri Hustvedt called What I Loved. Part rumination on art and psychology, part murder mystery. It’s a great book. I try not to think too much about my enormous TBR! How very apropos it is to have a TBR shrine! I loved The House of the Spirits by Allende, I have enjoyed other books by her as well. Here’s my Literary Fiction post. I love the shrine! My TBR pile scares me. It might topple over on me and I’ll never move again. I’ve always wanted to try an Allende book, I might start with House of the Spirits. I agree with you; THE SECRET LIFE OF BEES is an all-time favorite! All of your selections look interesting, though I haven’t read any of them! And your TRB pile?! Drool! Really! What a neat pile your TBR stack makes. I’m too embarrassed to share my tumble…. Oh, that isn’t even close to my whole TBR pile. I have many more, lol. I always always and forever have preferred reading books that are set either in the present or the future. But I’m more partial to the present ones. I’ve never been a fan of historical novels, books, or anything of the likes. Not even the classics could make me want to read… And I like reading a somewhat dark novel from time to time. Specially ones with happy endings, since I read to escape my reality. And mine is BookPics haha. Oh boy. Anyway. Nice to meet you!!! Mine would be Hopeless and Slammed by Colleen Hoover!